Our hotel was first opened in 1961. The convenient location in the centre of the ancient Chernigov provides visitors with the possibility of quick and free reach to any point of a city. Near the hotel post, shops, banks, ATMs, theatre, a hairdressing salon, cafe, pharmacy, central market are situated. In the main hall, on the ground floor, the reception service is placed, where you will be hospitably met by the main manager and provided with all the necessary information. For your services are offered 86 comfortable rooms with the nice, modern interior. In each room there are new furniture of the individual design, TV set with a cable television, a refrigerator, phone and access to the internet network. Moreover, an entrance hall, a bathroom with a shower and toilet. The hot and cold water supply is constant. On the hotel’s ground floor the hairdressing salon, restaurant and sushi bar are situated. 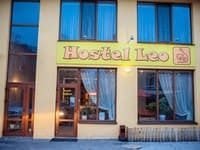 Also for your services: a breakfast, a dinner and a supper; car parking; an additional place in deluxe rooms, a junior suite and double; a laundry (for urgent individual washings); free iron, the hair dryer, an electric kettle, etc. We are sure, that exactly our hotel will be the perfect place of your pleasant relaxation! Description of the room: One-room single room with one and a half double bed. Description of the room: Two double room. The bedroom has two single beds in the living room - soft corner. 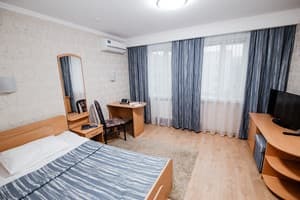 Description of the room: Two-room apartment with a double bed. The room has a living room with a sofa and a bedroom. Description of the room: Two-room suite with a double bed. The room has a living room with a balcony and a bedroom. Description of the room: Two-room apartment with kitchen. Children under 7 years without a separate bed are accommodated free of charge. It is possible to provide an extra bed. The service is chargeable (UAH 150 / day), requires prior approval upon booking. Complex breakfasts (48 UAH) from 7:30 to 10:00, complex lunches (65 UAH) and dinners (65 UAH). 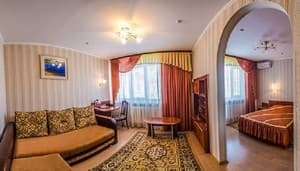 The convenient location in the centre of the ancient Chernigov provides visitors with the possibility of quick and free reach to any point of a city. Near the hotel post, shops, banks, ATMs, theatre, a hairdressing salon, cafe, pharmacy, central market are situated. 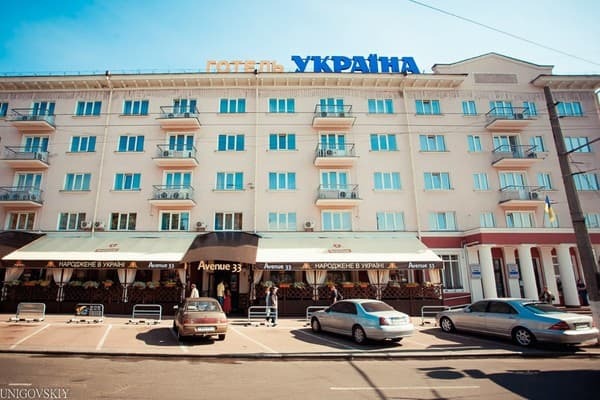 By car: go in the direction of the city center to the intersection of Mira and Pobeda Avenue. From the railway and the central bus station: buses Nos. 12, 17 to the stop "Gotel" Ukraina "»; Fixed-route taxi №№ 8, 11, 12, 37, 43, 160 to the stop "Gotel" Ukraina ".